My Sweet Haven: Those were the days!!!! It's been 18 long years!!! My memory of our beloved YLAC Elementary School Graduation seems so faint and distant. Of course I still remember these faces but I couldn't exactly recall what happened on that day. Too bad, eh! I don't even think that I still got a copy of this picture back home in PI. We've moved three times and a couple of super typhoons have hit us and I guess that's how we lost the old pictures. 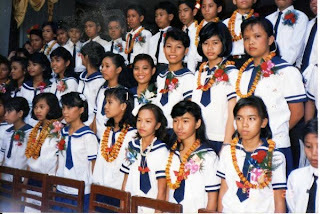 Anyway, I grabbed this pic from a friendster acccount of an elementary classmate and friend of mine, Jessica Jenny. I'm happy that I still get in touch with at least 4 of the faces in this photograph. I showed this pic to my hubby and I was surprised that he recognized me right away. He said it had something to do with my eyes and the way I look at something. Amazing, isn't it? Btw, to those who didn't recognize me, I am that second little girl from the right on the first row.